What do you use as a MySQL Server for Magento? Percona provides a set of improvments for InnoDB storage used by Magento intensively, but these improvements do make a difference when running a Magento store. How do you improve performance (general approaches about architecture, not specific info about setting specific variables like innodb_flush_log_at_trx_commit=2 and so on). I know NBS tryied master-master replication but that is not stable. I did encounter quite some issues with a master-slave replication with reads redirected towards the slave, because there were some delays in replicating data. Moving out of MySQL as much as possible? (search to solr and so on). You're getting into a broad, broad world of optimisation here and there certainly isn't a one size fits all approach. Do you mean the page load time for a single user, or the overall capacity/total concurrency? The two are very distinctly different - and not strictly related. It is entirely possible to have a fast store with limited capacity; or a slow store with lots of capacity. You have to tackle each independently with their own solutions - especially since each have their own bottlenecks. Lets make the assumption you are with a competent host that has already configured the other aspects of your server optimally for your store. No. Not directly. 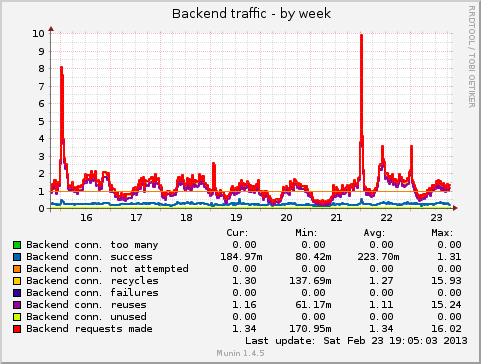 Its all about latency, in the majority of cases when testing page load time - only the caches will be hit. So the key here is to minimise latency. Increase network capacity. You would be surprised at the many megabytes per second being exchanged between a Web and DB server, usually in excess of 10MB/s - so a minimum of 100Mb/s is required s1. Or, just move the DB server locally. Using SOLR. External engines are sometimes better suited, SOLR certainly is faster for LARGER catalogues (and I'd stress, larger catalogues). Even un-tuned SOLR will produce layered navigation and search results faster than MySQL can. But these changes will have such a fractional impact on page load time - where the bottleneck is really elsewhere. Tune the application. Magento has some fairly big bugs with the way it builds collections and caches them; we've come across a number of big core code issues that can cripple performance. In a few cases, simply removing the product count display on the layered navigation results shaved 2 seconds of loading a big collection. Review MySQL slow logs. Check slow queries and add indexes as necessary. The difference between running a complex query with multiple joins with and without appropriate indexes can be tens of seconds. The application is the bottleneck. Not the software. So merely improving core-code or making your template less heavy will have a far more dramatic effect on performance than ANY MySQL configuration change. Changing the storage engine. MariaDB and Percona share the same InnoDB engine - Percona XtraDB. They can be treated as one and the same. In terms of single query execution time - performance will exactly mirror a vanilla MySQL build. This comes into play under load/concurrency. Running a MySQL slave. This won't improve performance unless the slave is located physically closer (from a network perspective), or that the slave has better hardware than the master. This comes into play under load/concurrency. Running an external DB server. This is by far the worst advice we see repeatedly handed out by many hosts/agencies. 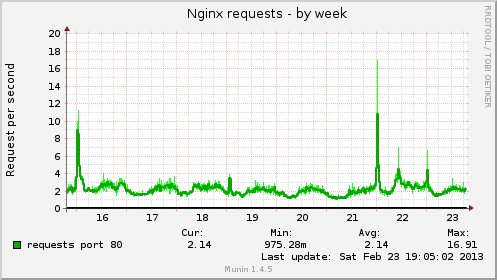 Until you have hit a ceiling on hardware/resources or you've got multiple web servers (read: high-availability), MySQL on the local machine for a Magento store is A Good Idea. It cuts out all the network overhead and latency. Even a 100Gb/s network (yes, one hundred gigabits per second) will not compare with a local unix socket for raw volume, throughput and latency. s1 For separate database servers only. Doesn't apply to local DB servers. Maybe. But only once you've nailed your PHP performance and capacity to the point where MySQL is slowing things down. 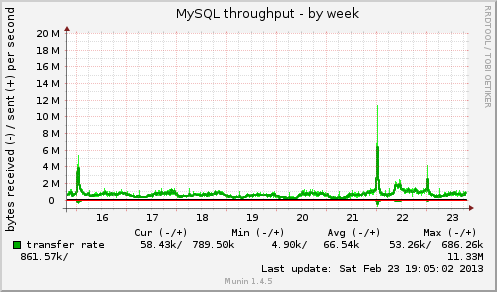 If you've got Varnish and FPC properly configured (don't get us started on how many failed attempts we've seen with either) - then MySQL does become a bottleneck. So in addition to the above modifications. Change MySQL engine. XtraDB can excel under load and does show genuine benefits over a stock MySQL distribution. 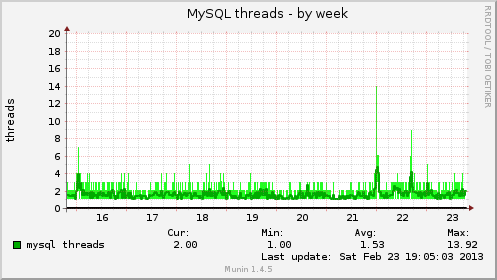 Stay up to date with MySQL. 5.5 performs better than 5.0 under load. Change layered navigation engine. Again, SOLR is a brilliant engine for layered navigation and due to its non-locking nature is far faster than MySQL. Master/Master. Due to the pretty high tipping point of hardware saturation of a Master/Slave set up (in excess of 1000 orders per hour) - we've never found it a requirement to use Master/Master in production. We have performed extensive testing, but never found it to be advantageous from a performance perspective and with the inherent risks and problems of Master/Master, it simply isn't worth it. The last paragraph really leads on to a key area of read and write scalability. Read scaling can be performed fairly infinitely without too much complication with the addition of more and more slaves. Given Magento's ratio of Reads to Writes is about 0.1% - considering writes shouldn't be much of a concern. That's why I've not bothered mentioning MySQL Cluster and its clever features like auto-sharding (splitting tables off to separate machines). Hardware is easily the quickest answer when it comes to improvement, so I've deliberately not mentioned it above in both scenarios. Nowadays, there's a really high ceiling on how high you can actually scale on hardware. Lets ignore the myth of infinite scaling "in the cloud" as cloud hardware tends to be fairly mediocre. For example Amazon's flagship models only being 12 Cores @ 3.3GHz. But outside of this, there are some very powerful servers available - our top server has 160 cores and 2TB (yes, Terabytes) of RAM. We've not seen anyone exceed the capabilities of that just yet. So you've got a massive scope for vertical scaling, before you even need to consider horizontal scaling. Its worth mentioning that in the pursuit of performance, the bottleneck will always keep moving. For a stock Magento store. It pretty much becomes a case of rinse-wash repeat. But what is clear to understand is that MySQL certainly isn't the first port of call for optimisation - and really only comes into play when MySQL is consuming more CPU proportionally to PHP - and this ONLY ever happens when both FPC and Varnish are in use and the server(s) are purely processing orders and nothing much else (because everything else is in caches). Simply adding a MySQL slave because you read us say above that it will help, can cost you performance and reliability on a huge level. A congested network, low spec slave server or even improper settings can cause replication problems that can render your store slower than it was to begin with - or cause synchronisation issues between the Master and Slave. To put things into perspective - some real world examples. We've used the following hardware to serve 300 orders per hour; and only at that tipping point - we then felt the need to add a dedicated MySQL server and a local MySQL slave. During the entire time, load averages remained under 3.00. 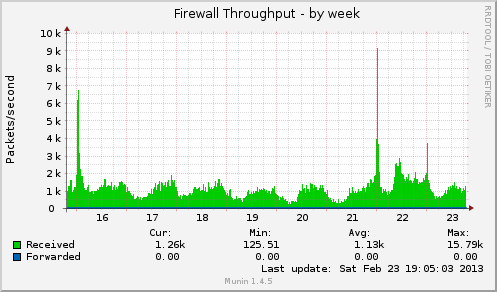 Just two days ago, a new client of ours easily soaked up a big traffic spike. Processing 180 orders per hour with a single-server and Magento Community Edition. During the entire time, load averages remained under 6.00. The load was higher in this scenario and that was down to a couple of factors. And given the recency of this, we've still got the detailed statistics to give some feedback by means of graphs. These tell an excellent story of how load is distributed amongst the key components of a separated Magento architecture (load balancer, web server, db server etc. - using MageStack). So from front to back ... the date you want to look at is at 12:00am on 22nd February. This image really tells it all. 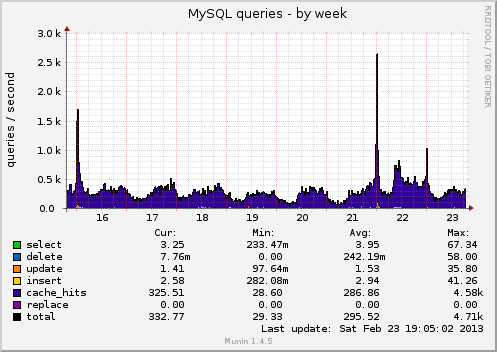 And it is that MySQL is certainly not a burden - not yet at least. So our advice, focus your performance concerns elsewhere, unless you are processing more than a few thousand orders per hour. Making performance changes isn't "one size fits all". It is a case of analysing your current bottlenecks and making subtle changes/adjustments to suit your store and infrastructure. We do use Percona XtraDB, almost exclusively. We run custom-compiled builds of MySQL that we developed specifically for Magento and had consulted Percona during the process. But it wasn't just performance that influenced this choice. And much more. 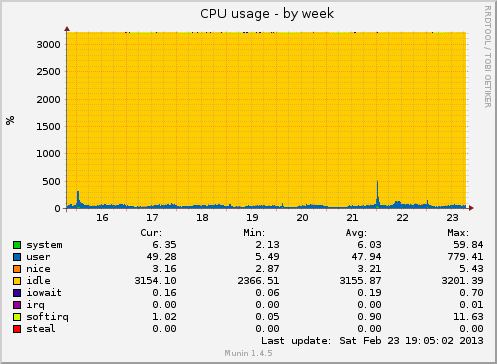 So using it over MySQL had other advantages than just performance. In fact - MySQL is and has always been the least of our concerns in the pursuit of performance and stability. Not the answer you're looking for? Browse other questions tagged performance mysql or ask your own question. Some Magento tables are not InnoDB, is it safe to convert all tables to InnoDB? What are some code optimization tips? Can we use MySql enterprise edition with Magento community edition? Performance gain for removing websites? 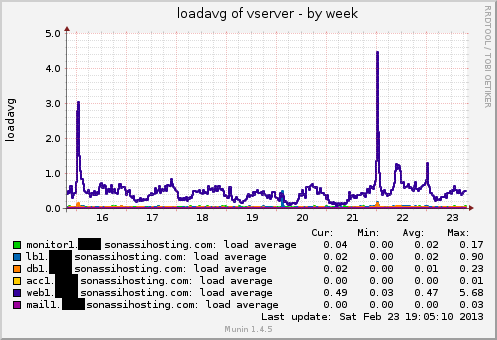 Database performance issue even on new server. database issue on magento store? How does the number of products affect magento/server performance?